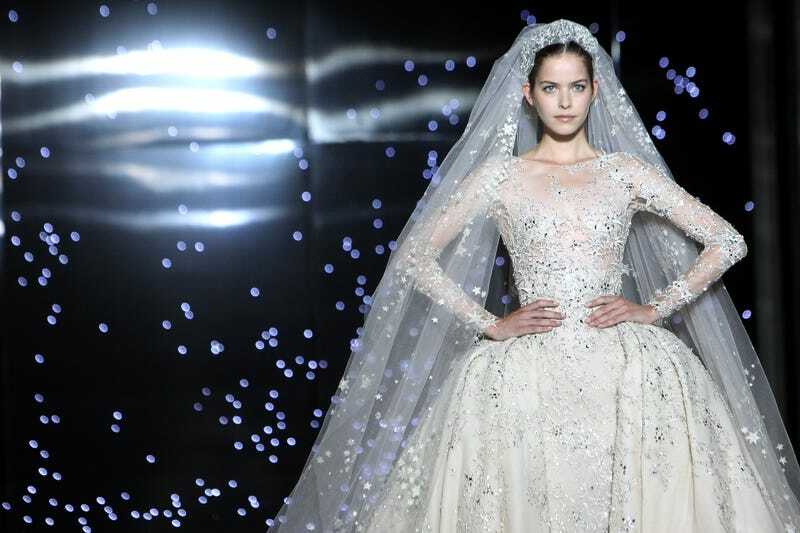 Paris Haute Couture Week just wrapped up and almost all of the designs featured are dramatic by default, so it’s not always clear which dresses designers explicitly intend to be viewed as a wedding gown. Anything could qualify: This diaphanous number from Dior Couture would look lovely on a bride; Giambattista Valli’s white-skirted ballgowns would work too. Franck Sorbier’s trippy, all-white collection could be considered “bridal,” even though he (almost certainly) didn’t design it as such. Mostly this is a matter left up to the interpretation of the buyer/bride, but some of these shows do feature a look specifically designed to be a wedding dress that the designer sends out last, often with a a veil or an abundance of white or some scrap of tulle—anything “extra” that might set off bridal sirens. There’s not a ton of that in this week’s Fall 2015 couture collections, just a small handful, though Maison Margiela’s white garbage-bag gown deserves top billing. If you’re a bride who gets off on watching your family question your sanity, this voluminous sci-fi garment with outstanding Derelicte details is a winner. ...but because it was worn by Kendall Jenner.